An audiobook is a worthy companion whether you are working out, commuting to work, or going on a well-deserved vacation. Traditional and paperback books are being converted to audiobooks nowadays in order to provide the convenience of listening to your favorite books while you are getting things done. You can use an app on your iPhone to access and listen audiobooks without any hassle. You'll learn the best free audiobook app for iPhone in this article. You have probably already heard about Audible if you listen to YouTube podcasts. Audible gives you access to more than 150,000 books. It is the best Audiobook app for iPhone in 2017. And it is free to use; however, you will have to purchase a book in order to read it. Audible offers you one free book when you sign up. There are books in the Audible library that you can either read or listen. Access to over 150,000 books. Listen to books on different devices. Get a free book when you sign up. Wattpad is a free Audiobook app for iPhone that allows you to discover new writers and find free books. Furthermore, you can also communicate with other readers and writers as well as comment on stories. There's also a voting feature that allows you to vote on your favorite pieces to help increase their ranking in the library. Unlike the other apps on the list, Wattpad allows you to actually contribute to the library. All books in the library are free. Interact with other readers as well as writers. Search for more than 30,000 libraries around the country and have access to audiobooks via OverDrive iOS app. OverDrive has been proved the best free Audiobook app for iPhone. You can access the collection of a library from anywhere with OverDrive if you have a library card from that library. Borrow books anytime you want, even when the library is closed. Furthermore, you can also request certain titles that are not available in the library by contacting the librarians. Access numerous libraries around the country. Download books any time you want, even when the library is closed. OverDrive automatically returns the books you borrow when they are due. Kindle app allows you to access the huge Kindle library that contains over 3 million books, audiobooks, newspapers, and magazines. It is the best Audiobook app for iPhone 6. You can add any of them to your library conveniently. You can either purchase publications separately or subscribe to Kindle eBook and gain access to more than 800,000 titles. Furthermore, the app has many customization features such as adjusting text color, text size, background lighting, etc. Adjust various configurations to enhance your reading experience. Read a sample of any audiobook, magazine, etc. before you make a purchase. Research on Wikipedia inside a book. There's another way to manage your audiobooks: download them from a website to your computer and then transfer them to your iPhone when needed. It is recommended that you use iMyFone TunesMate to transfer audiobooks to your iPhone as it is the best audiobook management tool that has been designed to facilitate iPhone users. It offers fast, convenient, and efficient way to manage your audiobooks and transfer them between your iPhone and computer. Transfer your audiobooks and other media from iDevice to computer and vice versa. 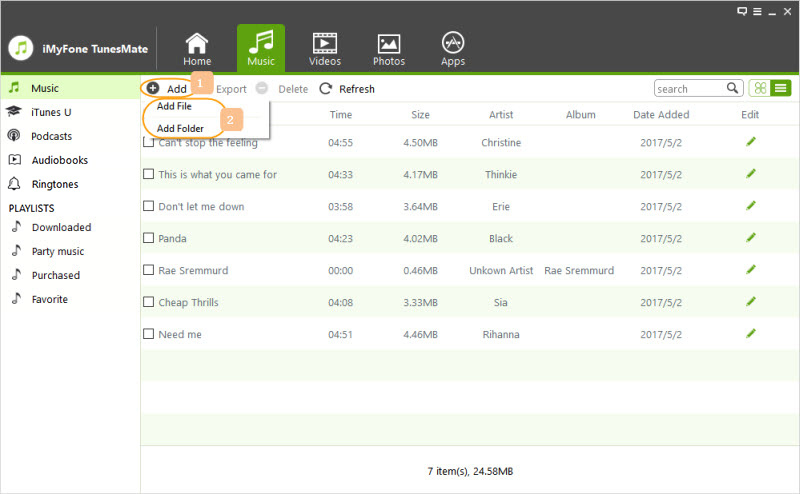 Many types of media files are supported including audiobooks, music, videos, movies, playlists, etc. Transfer purchased and non-purchased files between your iDevice and computer without any hassles. Rebuild corrupted iTunes library as well as share it with friends, even if they are using different Apple ID. You don't have to launch iTunes to transfer your audiobooks to your iPhone. Preview your iPhone media files before transferring them. Step 1: Use a compatible USB cable to connect your iPhone to your Windows PC or Mac. And launch TunesMate. Step 2: Click on Music tab and then choose Audiobooks from the sidebar on the next screen. 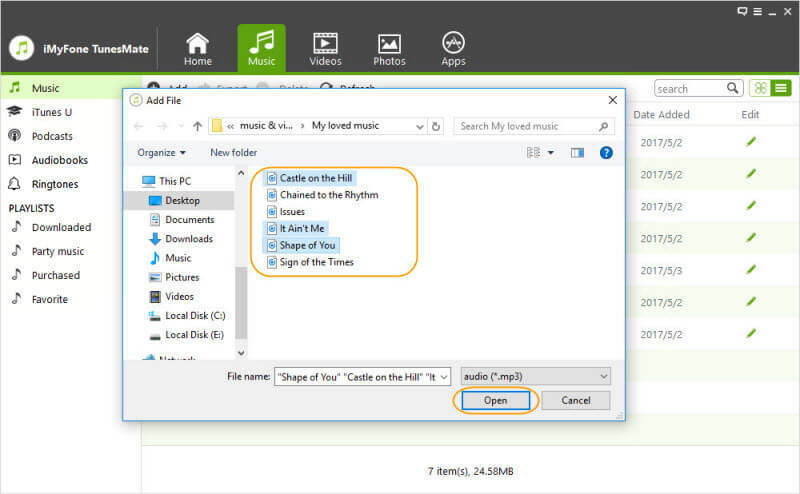 Step 3: Now click on Add > Add File option and then navigate to your audiobooks on your computer's hard drive. Step 4: Select the audiobooks you wish to transfer to your iPhone and click Open. Your selected audiobooks will start transferring to your iPhone.